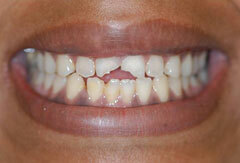 A filling can correct a small hole in the teeth. 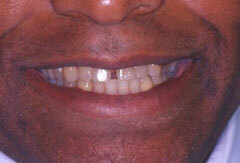 To rebuild, reshape or protect your tooth, a crown is needed. 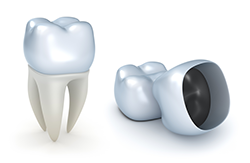 A crown, also called a 'cap,' is a tooth-like restoration that is placed over an existing tooth to restore the function, shape, appearance and strength of the damaged tooth. 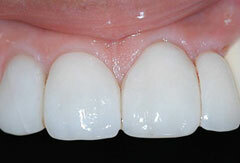 Crowns serve to protect and cover the tooth when there is no longer sufficient tooth structure left to place a filling. 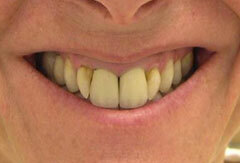 Crowns may also be used to protect the structure of a tooth that is fractured, broken, or has had root canal treatment. 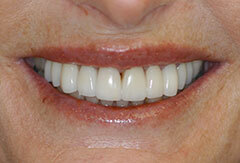 Crowns are placed over two visits, approximately two weeks apart. 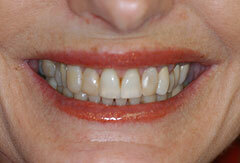 At the first visit, the tooth is reshaped or "prepared." This may include rebuilding part of the tooth with a crown buildup. Dr. Mazza will determine the best approach for your particular needs. A mold is then made of this tooth (the mold usually includes adjacent teeth and the teeth that this one bites against). From this mold, the laboratory constructs your crown with the porcelain color matched to your tooth. While the crown is being constructed, you will have a temporary crown on your tooth. The temporary crown is usually made of plastic (it can also be metal), and is not intended for long-term wear. It is usually in position from 2 to 6 weeks at most. It is to protect the tooth from sensitivity (temperature, touch), protect the gums, and keep the adjacent and opposing teeth from shifting. A temporary crown is like a temporary tire - it is sufficient for short-term, careful use. 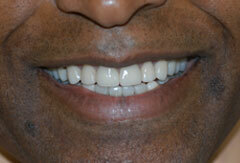 At the second appointment, the final crown is glued on your tooth after the temporary crown is gently removed. If your tooth is sensitive, you may require some anesthesia. Your new crown is assessed for fit, color, shape and appearance, bite, fit between teeth, and seal against your tooth. If everything is correct and it meets your approval, it is cemented with a long-term cement. 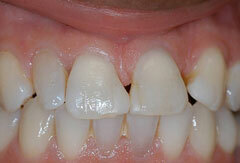 Treat the crown as if it is your own tooth, especially for cleaning. It is not uncommon to experience a little sensitivity to cold after getting a new crown, but this should diminish quickly over a couple weeks. There are different materials which can be used to fashion a crown. 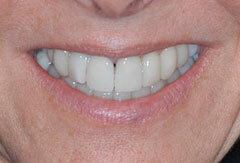 In our practice, crowns are generally composed of porcelain overlying high noble metal. This type of crown offers cosmetic uniformity, and the color of the crown is matched to your teeth with technological strength. 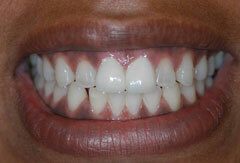 It is the most durable choice for crowns. Sometimes I recommend that the back teeth have metal at the chewing surfaces of the crown to add to their durability. Crowns function and feel just like your natural teeth. To help maintain your crown, brush your teeth twice per day, floss regularly, and be sure to see Dr. Mazza every 6 months for routine cleanings and examinations.